For weeks I've been slowly earning the trust of a pair of bluebirds who are nesting here for the first time. Then suddenly a tufted titmouse shows up. Titmouse looks me in the eye and comes straight up to my table for mealworms. On the third day it takes a mealworm from my hand. Meanwhile, the bluebirds watch in what looks to me like disbelief. 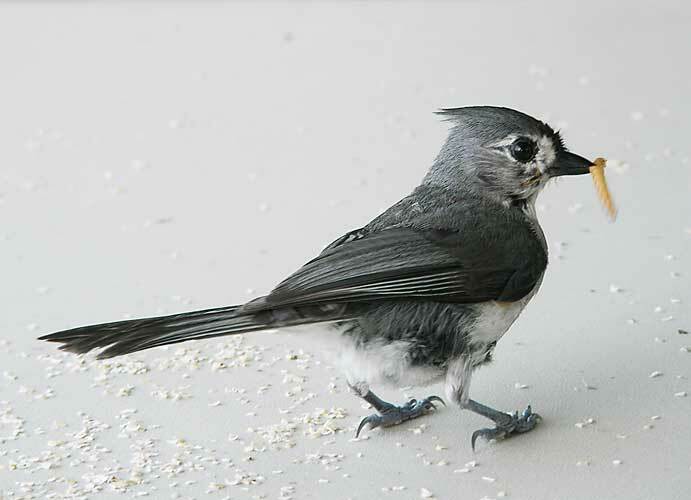 Tufted titmice are intelligent, adventurous birds. They're quick to see an unusual opportunity and take advantage of it. And they're quick! Compared to titmice, the bluebirds seem positively staid. It's pretty obvious that this titmouse is feeding young. After it grabs a mealworm or three off the table next to me, it flies around the corner of the house. I'd like to know where its nest is. The birds love this birdbath. A gorgeous red-winged blackbird comes every afternoon and takes a long, splashing bath. 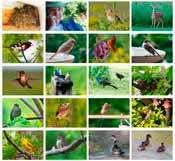 At our house, it also attracts bluebirds, goldfinches, cardinals, mourning doves, indigo buntings, rose-breasted grosbeaks, house wrens, eastern phoebes, and grey catbirds. This is now my favorite summer birdbath. Read more details about it . This binocular will let you see something special. It's not expensive. Read about it .